26 Advanced Marketing Funnel Conversion Tactics That Boost Sales... Almost Immediately! This is not... I repeat... NOT... for the newbie marketer or the online marketer who doesn’t currently have at least a basic marketing funnel. This... is for the truly advanced marketer who’s ready to jack-up their marketing funnel conversions with over 26 advanced marketing funnel super-conversion tactics. I’m talking about tactics used within the slickest marketing funnels that most average marketers don’t even know about... and certainly nobody is talking about. Hi, my name is Todd Brown. And I’m going to make this very quick and very easy for you if you’re ready for it. 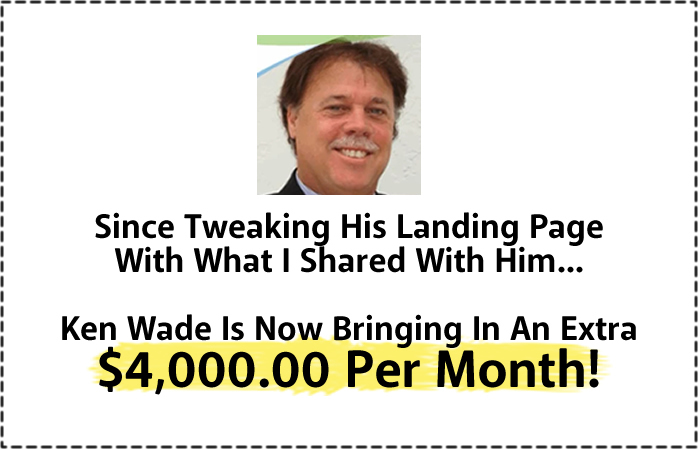 Currently I’m considered the foremost authority on engineering wildly profitable marketing funnels. Clients routinely pay a $5,000.00 monthly retainer to have me optimize their marketing funnels and boost conversions for them. 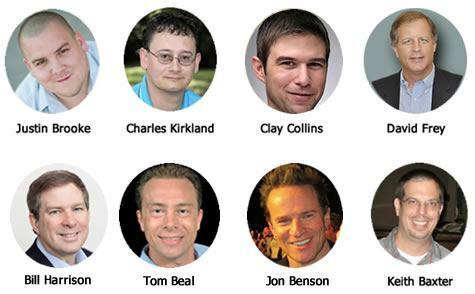 And some of the most well-known online marketers have gone through my Marketing Funnel Automation Coaching Program to get help with their own funnels, including experts like: Charles Kirkland, Justin Brooke, David Frey, Keith Baxter, and dozens more. And it was just a short time ago I partnered with Rich Schefren of Strategic Profits to oversee the engineering and launch of close to 15 new front-end customer acquisition funnels for Strategic Profits... what is today... over a 10 million dollar a year business. It’s called, simply, 26 Advanced Marketing Funnel Conversion Tactics. It’s a 2-hour-plus multi-media training that gives you a rare peek into the strategies-behind and tools that power 26 of the most advanced marketing funnel conversion tactics... the same tactics that drive the high-conversion rates of the slickest marketing funnels online. The 26 Advanced Marketing Funnel Conversion Tactics course includes video, audio, slide handouts, and a manual with the word-for-word transcript of the entire training. 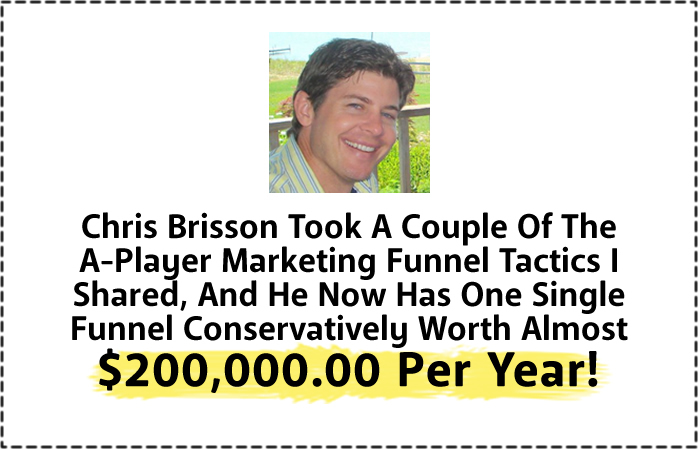 Every single tactic you get inside 26 Advanced Marketing Funnel Conversion Tactics has been tested and proven either within one of my own companies, or with one of my consulting clients or coaching students, or within the companies of one of my high-level marketing friends. Again, all SUPER ADVANCED STUFF! You won’t hear any of the typical or average or beginner marketing funnel methods and techniques so common among the masses of novice marketers. In fact, I guarantee there are at least 20 tactics you’ve never heard anyone else talk about anywhere. Even though, there’ being used to power some of the most profitable online marketing funnels in the internet marketing community. The 26 Advanced Marketing Funnel Conversion Tactics training is for you if you have a marketing funnel right now that’s just simply not cutting it when it comes to the volume of new customers and transactions it’s bringing you. It’s also for you if your current marketing funnel is not bringing you a big enough return on investment from your advertising, is not bringing you a high enough transaction value from new customers, or is simply not bringing you the kind of money you need to enjoy the online entrepreneurial lifestyle. And, frankly, it’s also for if you’re simply curious about what tactics drive the crazy high conversion rates and sales numbers behind some of the best marketing funnels on the web. Why is nobody else sharing these tactics? Because frankly, nobody else does the volume of work on marketing funnels that I do or has access to the volume of high-level client funnels I get every month. So most marketers just don’t know about or even hear about the high-level stuff being done to double, triple, and even quadruple conversion rates and new customer acquisition. 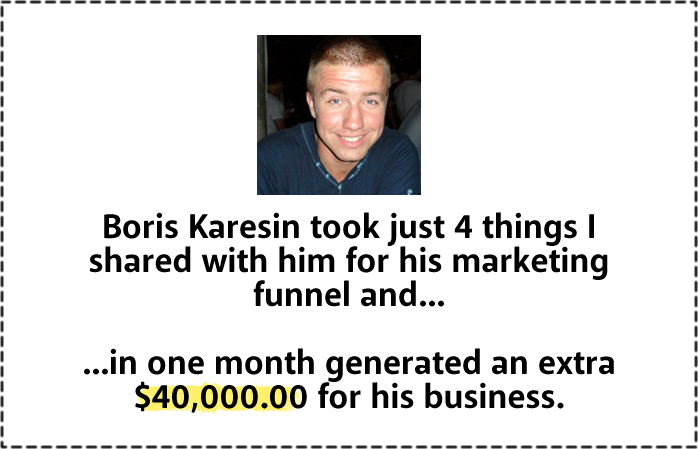 Would you be willing to invest just $1 for a single advanced marketing funnel conversion tactic that was virtually guaranteed to wildly boost the amount of new customers your marketing funnel brings you every month? If not, obviously this the wrong video for you. But if you would be willing to invest $1 for one advanced marketing funnel conversion tactic than I have an incredible deal for you. This way you’re guaranteed to make multiples of your money back. 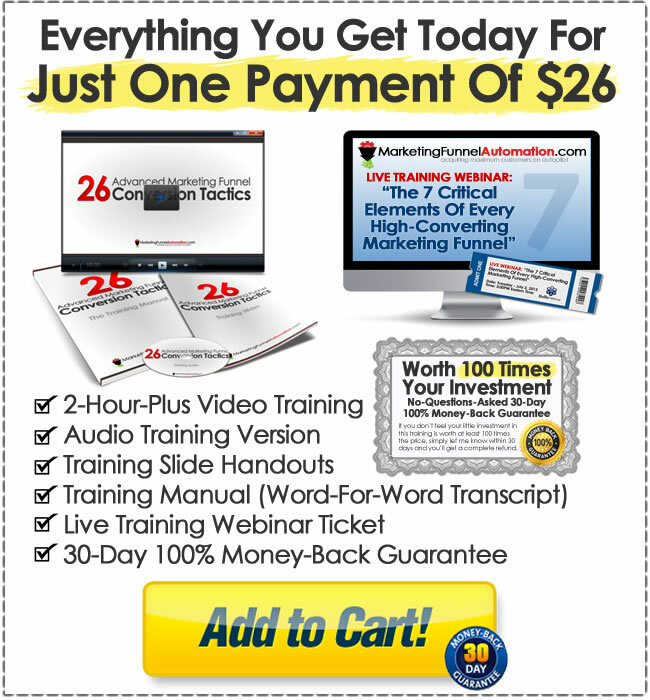 So you get the entire training and all 26 advanced marketing funnel conversion tactics for just $1 per tactic... just one payment of $26 bucks for everything. Just one payment of $26. Because, simply, the MFA brand is less than a year old and I want to win you over as a new customer. So, delivering incredible value at an incredible bargain is may way of doing that. So again, today, you get the entire 26 Advanced Marketing Funnel Conversion Tactics training course for just one payment of $26. 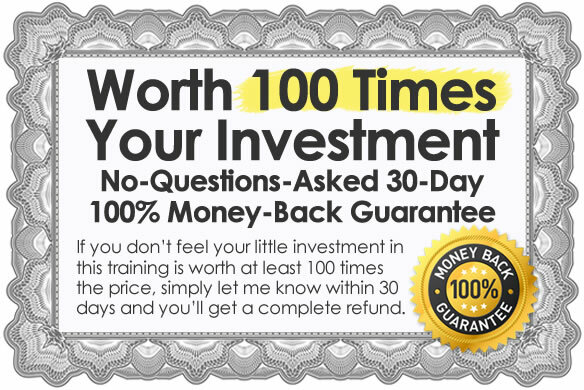 As well, I’m going to give you a special FREE BONUS when you grab the training today. 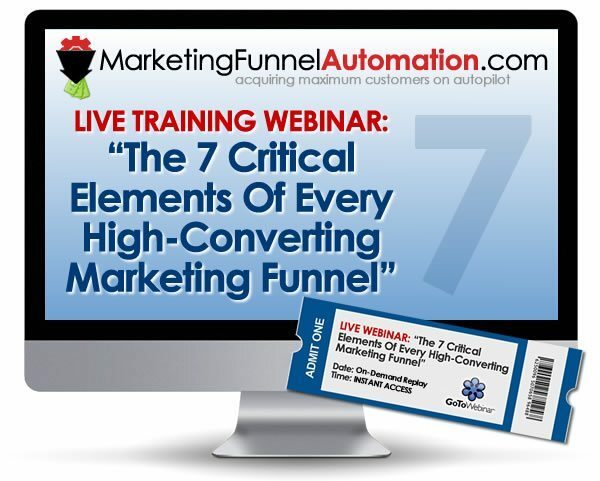 It’s called, “The 7 Critical Elements Of Every High-Converting Marketing Funnel” and it’s a private live 2-hour webinar training I conducted for private clients... that you get immediate access to. On this special one-time training I’ll ensure you have all the foundational elements in place of a high-converting marketing funnel... this way, together, we know that while you’re adding the advanced conversion tactics you’re doing it for a funnel that’s built on a high-converting foundation. I could easily charge $97 for this training alone. 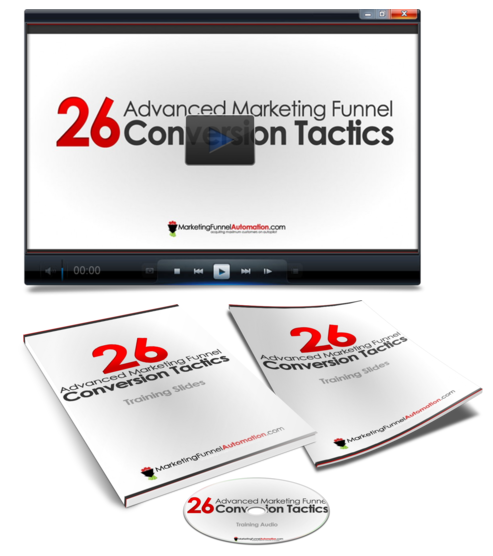 And I might for folks that don’t grab their copy of the 26 Advanced Marketing Funnel Conversion Tactics course. But, for now, when you order your copy today, you get one ticket to access the entire thing for FREE. 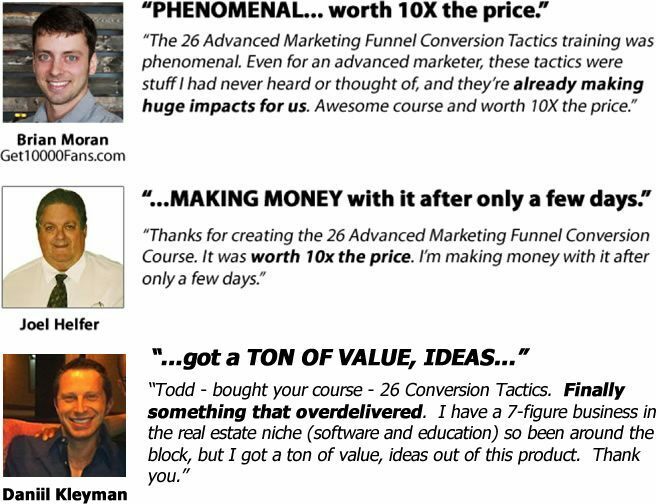 And just to settle any concern you may have... if you’ve never gotten any kind of training from me before... when you grab your copy today of the 26 Advanced Marketing Funnel Conversion Tactics training, you’ll also get a complete no-questions-asked, 30-day 100% money-back guarantee. Simply grab your copy today, go through the training, download all the resources, even go through the entire live bonus webinar training, and if you don’t feel it’ll be worth at least 100 times your investment of $26... simply let me know and you’ll get a complete refund. And you can still keep all the recordings as my way of saying thank you for giving me a shot. So, to get your copy of the 26 Advanced Marketing Funnel Conversion Tactics course including the 2-hour-plus video training, audio version, slide handouts, manual with the word-for-word transcript, and access to the live webinar training, simply click the add to cart button below. And as soon as you do you’ll instant access to the entire training. * TIME-SENSITIVE NOTICE: This price point is just a marketing test. Based on our test results the price may go up significantly. Or not. I don't know. But if it does go up, it will happen without any notice. So if you want the entire package for just $26, I recommend you jump at it now.